I'm travelling across East Africa for 3 months and hope to dive in Kenya and Mozambique. My GP has given me a tablet called mefloquine to take against malaria. Is it OK to dive whilst I take this? As you may have read, mefloquine is the most recent medication against malaria. It was developed to combat the drug resistant strains of malaria that were spreading in some parts of the world. As you are going to a chloroquine resistant malaria area then you must take this medication. But what has become apparent over the last few years is that there are some side effects with these tablets. Some of these may mimic decompression sickness and are hard to differentiate, such as tremors, dizziness, rashes and joint pains. Of course not everybody gets these problems but I would suggest that you will find out by the 3rd or 4th dose if you get them or not. So take the tablets each week and start them at least this long before you plan to dive so you know how you feel each time you take them. My wife and I are travelling to Roatan on the 29th April. Rotan is one of the Bay Islands off of Honduras. It has been recommended to us that we take Malaria tablets (Chloroquine) as the Islands are in the local Malaria zone.Can you please advise whether it is safe to take Chloroquine whilst diving - I have been advised by my local dive shop that you cannot dive with all Malaria medicines and the Chemist didn't know anything about it! Finally, if Chloroquine is not suitable can you please recommend a medicine that will allow us to dive whilst protecting us against the Honduran mosquito!! No worries here. Chloroquine is perfectly fine to dive with. It has few side effects, can be bought over the counter, and is taken weekly to prevent malaria. There are some antimalarials which can cause problems with diving, and I have mentioned them before in these pages. Go to the e-med dive pages where I archive all the copy to find out more. I spent a long old while in Roatan. Loved it, me. Though my landlord, a local man demanded no smoking, drinking or any pleasurable activity in his hotel. He and his wife were from some strange religious sect, although when she popped off the island for a few days on urgent family business, I was surprised to find him in a pool of his own vomit, drunk singing garbled hymns. Such is deep faith at times, rooted in hypocrisy. Oh, by the way, you must do the night dive in the West End Bay, my top dive ever. Yes, it is Hilary from Divequest (we have arranged a couple of trips for you in the past, and would like to arrange more for you in the future!). I wonder if I could have your opinion on the following. Recently, at a party, I met a retired Consultant Physician and our conversation turned to malaria prophylaxis (as it does at parties!). This person told me that the 'supposed' neuro-psychiatric side effects of Larium were unrecorded outside the UK and that the rest of the world used Larium quite happily. Of course if this is true and we British divers are all deluded, it would be quite interesting to know. I am sure Divequest divers, and others, would be fascinated to learn if this was indeed the case. "Unrecorded outside the UK"?? What a load of twaddle. I remember when this medication came out. It was tested in the first Gulf War on bomb wary GI's, whom could not tell a drug related side effect, from the nuttiness brought on by shell shock. Then as I am spending half a year in Africa in the 90's, about 30% of the travellers on this medication reported side effects. One Aussie girl woke up, up a tree after taking one at night. Another American girl, used to dread the day when her Lariam dose coincided with her PMT. We witnessed it when it did. Thank God for those big Zulu shields and assegies, we were well protected. Lariam, though does have its place. A weekly anti-malarial. Little resistance. So I always suggest that, if you are going to an area of high resisitance, then take a test dose before you go. If you go nuts on it, then stay clear of it. But if it has absolutely no side effects with you, then you may be OK to dive on this med. The thing to remember is that when abroad, not getting malaria is more important than diving. I know. I got cerebral malaria in Ouagdougou. So bad it stopped me smoking and made me lose 2 stone. What a bummer of an illness. Thanks to quinine and the Tropical Diseases Hospital, I got better, fatter and back onto the tabs again. Healthy at last. Point of note. Malarone is now around and good for all the areas Lariam was used. It is a daily tablet and expensive, but cheaper than a psych consult afterwards. I am wondering if you could please give me some advice, or if not a contact that may be able to help me please. I am due to be travelling to countries where malaria tablets are recommended and I am wondering what, if any, complications there are between taking these tablets and scuba diving (I will be diving frequently while I am there). My local GP and I found that on the website Travelex, malarone is recommended as being 'best for scuba divers', but it does not give any explanation as to why, or whether the others (doxycycline in particular) is not recommended for scuba divers. I would be very grateful for any advice you can give me. Hi. This one comes up all the time as malaria-carrying mosquitos seem to hang out at all the best dive sites. Any advice about malaria should start with the following, if obvious, comment: don't get bitten. No medication can really offer 100% protection, so best to avoid the blighters in the first place. You need to wear long sleeved shirts, avoid swampy areas at dusk (when they come out to feed) and use a net at all times when you sleep. The only anti-malarial to avoid is mefloquine (Lariam), as it can cause side effects that mimic decompression illness, eg. 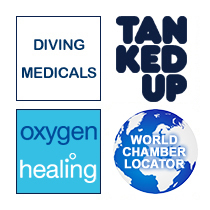 joint pains, rashes, dizziness, as well as increasing your susceptibility to narcosis. The others, including doxycycline and Malarone, are safe to take whilst diving, so be guided by the recommendations for the area you're going to. We are lucky enough to be going on a diving trip to Puerto Galera and Dumaguete in the Philippines next February. Our friends have been going to the Dive Centres there for the last 4 years and do not take anti malarial drugs. The write up for the hotels say that their sites are Malaria free but having consulted our local practitioner's nurse and researching the internet we are not happy with this approach. We have heard horror stories in the past about the bad side effects of taking some anti-malarial drugs, and of course we don't want to take anything which contraindicates diving as we want to see those Pygmy Seahorses! I have spent a lot of time researching on the travel doctor websites, but in places this seems to contradict itself and we would be very grateful if you could clarify what preventative treatment is required (alongside all the precautionary measures to avoid being bitten which we take when going abroad). Right, your friends have been going for 4 years with no antimalarials. The hotels say it’s all OK. Some travel websites say it is alright. But some don’t. From the balance of evidence M’lud, I would suggest to the jury that the malarial parasite may be innocent in this case. But, the Pygmy Seahorses guilty of spreading fear and nicking my bike. The bottom line is that mossies need still fresh stale water to breed in. If you are surrounded by salty water ocean only you should be fine. Also some travel websites only do the Philippines as a whole, but some are micro specific to local areas. Trust the latter. If you do need to take the meds then the safe for diving ones are malarone, doxycycline and chloroquine/paludrine, depending on local resistance. But the jury reckons that you should be fine without really. I'm using these shoddy economic times and my recent redundancy as a good excuse to live out one of my dreams and travel through southeast Asia. My golden handshake was more a passionate bearhug (with tongues) so I'm lucky enough to be going on the road for the next year or so. I want to dive but am going to be taking antimalarials whilst out there. You probably get asked this a lot but what are the pros and cons of each antimalarial and which is best from a diving point of view? You’re right, I do get asked this a lot. Which stands to reason, as mosquitoes seem to enjoy most of the spots that divers do. Female mozzers of the Anopheles genus are the blighters that transmit malarial parasites, which hang out in their salivary glands. Mosquitoes actually feed mainly on nectar, but the female has to indulge in a “blood meal” to get the necessary proteins for egg development. After biting, the mosquito pumps in saliva to inhibit blood clotting, and thus squirts malaria directly into the victim’s bloodstream. Yuk. So before we get onto medication, the most important thing to say is don’t get bitten. Smother yourself in DEET and citronella, wear long-sleeves and trousers (smothered with DEET and citronella), burn coils and sleep under a net. As for prophylaxis, the world is now largely chloroquine-resistant; so the options are threefold. Resistance patterns vary so which one you pick will depend on the exact countries you’re visiting. Mefloquine (Lariam) is effective but resistance is developing in areas of southeast Asia and it can cause vivid and kooky dreams (some view this as a bonus, but if you do get lurid nightmares it’s best to steer clear of it if you’re diving). Doxycycline is good and cheap but has the potential to exaggerate sunburn and lead to yeast infections down below. Malarone is good and has few side effects, but is expensive. Whichever one you decide on, start it well before you depart so if any side effects do occur, you have time to switch to another.